There is no easier and responsible way to install your server than Ploi. There is no easier and faster way to configure a new site with Ploi. Distribute your traffic over your servers. Easy 1-click install to setup your own Load Balancer. Our system is optimized to detect Laravel applications and help you out. Need to setup a WordPress site? Just use the 1-click install feature we provide. OctoberCMS is a Laravel based CMS, installation is 1 click away. How can I use SFTP? By default, no FTP server is installed. But you can use SFTP which comes standard with the SSH protocol, you do not have to install anything on your server. 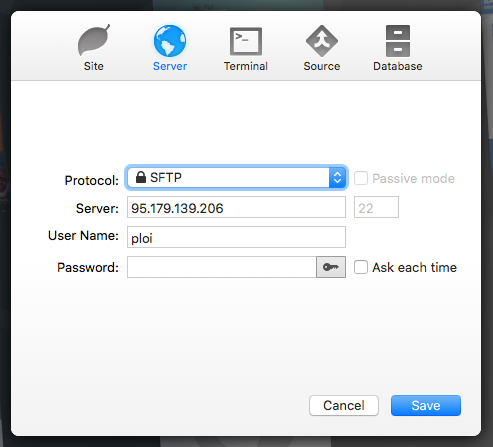 To connect to SFTP, you could either use the terminal or a FTP client. We recommend using Coda 2 or Filezilla. Normally, you would not have to enter a password because you authenticate with your SSH key. This can be done with any FTP client basically, you can authenticate with your SSH key file. 21 July 2018Can I see server logs? 07 August 2018How do I update/upgrade packages on my server? 02 September 2018How do I group servers? 18 October 2018How do I enable fail2ban on my server? 26 November 2018Where do I find my logs from queue's & cronjobs? Ploi handles all the difficult things that you don't want to do. Are you ready? Ploi is the brainchild of a group of enthusiastic young Laravel developers and is still being maintained and improved daily.